In urban areas all around the world, we are stretching towards the sky – to save space on the ground, and make room for our growing populations. 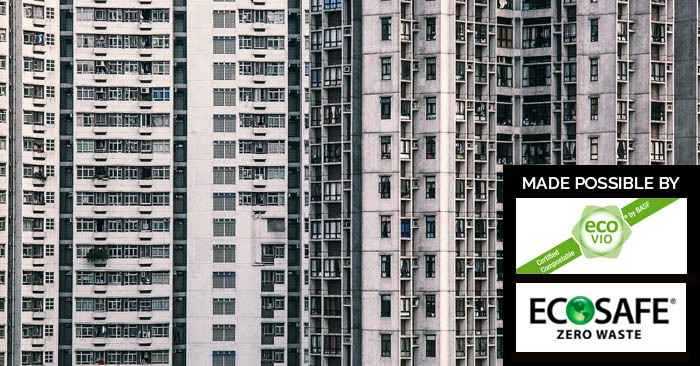 In this Multistory Special, we explore the major challenges and factors we need to pay attention to when planning an organics program in a multistory residential building, and we invite guests from cities around the world who are leading the way with their programs to share their experiences. This week, we’re taking a look at the main challenges we face today and the major factors we need to address when we start recycling organics in any type of multi-story building. This will lay the foundation for the episodes to come. EcoSafe® Zero Waste designs and implements cradle to cradle solutions for source separation of organics and recyclables with a focus on diverting organic waste from landfill to commercial compost facilities. We provide our customers with the products and services they need in order to build SUSTAINABLE, SOURCE SEPARATION and DIVERSION programs designed to achieve ZERO WASTE in communities, institutions, businesses, events and at home and in public. For more, visit their website. Sorting It Out: The State of Multifamily Recycling in Washington State. Washington State Recycling Association. July 3, 2014. Multifamily Recycling: Case Studies on Innovative Practices from around the World. Washington State Recycling Association. June 20, 2013. 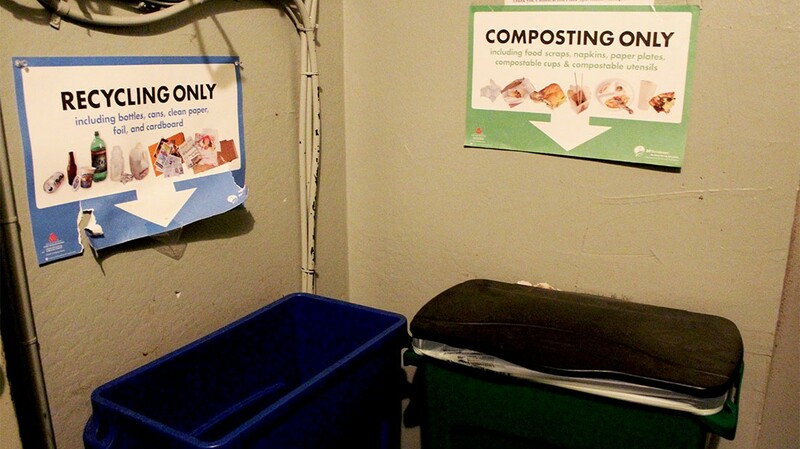 Best Practices for Multi-Family Food Scraps Collection. Recycling Council of British Columbia. February 2011. 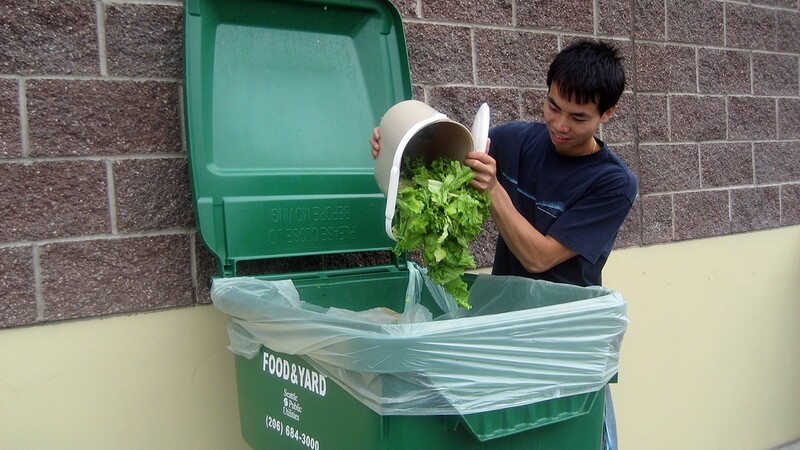 New York City Organics Collection Pilot Program Program Report, through March 2014. New York City Department of Sanitation. 2014. (Page 20). THE ORGANIC STREAM: There is no unified classification of multi-story buildings. Usually they are categorised in terms of height. 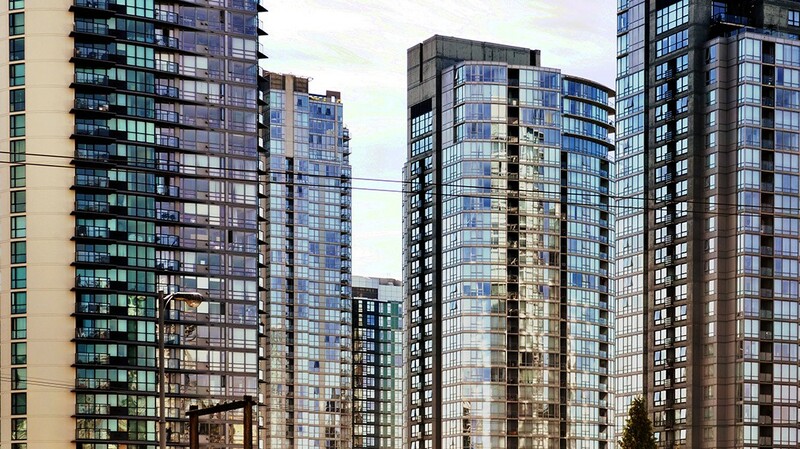 A typical description would be low-rise, mid-rise and high-rise buildings. Low rise buildings have very few floors. Again, there are no unified rules here, but they usually are no more than 3 stories high. These are quite easy to work with and usually have a centralised collection point. Mid-rise would generally be anything above 3 floors but below 8 floors. And high rises, then, are anything above 8 floors. These are typically the buildings we’re talking about in this episode – as they are the most challenging of the three categories. It might also be useful to categorise the buildings by the type of waste and recycling facilities they have – since this will have a big bearing on how you approach the building. Buildings usually have either a chute system (single or multi chute), waste rooms on every floor, or a single collection area on the ground floor, garage, or in the courtyard. No matter how you categorise them – it’s important to remember that each individual building will have its own challenges and advantages. For this reason, it could be useful to categorise them in terms of level of difficulty. This can take into account a range of issues that will effect your program like for example – whether there’s high turnover of tenants…. a lack of space or perhaps ventilation issues in the building…or if the building manager uninterested. TOS: So…where exactly are you going to put your bins, and how will the hauler access them? Are you working in a building with limited space and maybe ventilation issues? Is there a chute system in the building? Do you want to use it for organics? These are some of the key logistical question you’ll ask yourself in the beginning. And your decisions and how you implement them will have a great impact on success. TOS: This is Linda Corso, manager of Cathedral Hill Plaza on 1333 Gough Street, San Francisco. We took a trip to California last month to get a first-person view of the organics recycling program in the state and some of the buildings involved that have been successful. And we met with Linda, who was kind enough to show us around and tell us how the system works in her building. Cathedral Hill Plaza was built in the 1960s, so it’s an older building – it has 169 units, with 14 stories altogether. And Linda began a composting program at the building before it was even mandatory. LINDA CORSO: When I first read about it in the paper that Recology was starting composting, I started looking into it and talked to them about getting composting bins, which we initially put in the garage, and then just sent a memo to our tenants that composting was available. It didn’t work so well! TOS: Linda told us that nobody wanted to carry their icky compost bags all the way down to the garage when it was easier just to keep dumping it in the trash bin on their floor. 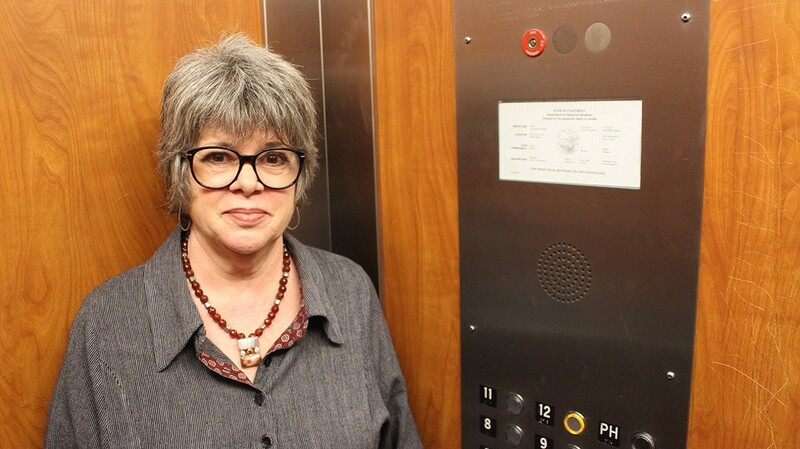 LINDA CORSO: Then I contacted SF Environment and they came out, walked through with me, got the slim-jim bins for both recycling and composting for our trash rooms – we have trash rooms on every floor, which makes it easier for the tenants. And they also came with Recology and set up in our lobby and brought bins and bags for tenants, and had an education thing one evening. They gave people a comfort level that there weren’t going to be bugs crawling all over – we empty the bins in the hallways every day. And it really took off. TOS: So in terms of logistics….to make the program work, bins were placed where tenants were already going to leave their waste. Instead of having them in the basement where they were less convenient. Linda showed us the waste rooms and they were spacious, thanks to the slim bins – and clean – thanks to the waste being collected every day. All in all, this is an excellent set-up. And after talking to Linda, here was me thinking that this system was probably the most ideal for buildings with waste rooms. But actually the truth is that using waste rooms in this way is not all that common or straight forward. (Trying to reach Alexa Keilty and getting voicemail). TOS: This is me trying to reach Alexa Keilty zero waste specialist at the department of Environment in San Francisco, who designed and implemented the multistory building food scrap collection & composting program. San Francisco has 8500 multistory buildings they work with, and their composting and recycling mandate has been in place since 2009. Just how has San Francisco navigated the waste room situation – and what do they do when a system like Linda’s doesn’t work? ALEXA KEILTY: So when we’re setting up a building, we look at if there’s an opportunity to collect on each floor; and if they have a trash room we look at that and we do provide bins at no cost for apartment buildings to collect on each floor – as long as they have maintenance staff in the building willing to collect it. And I have set up composting on each floor in buildings and it doesn’t always work if you don’t have proper ventilation and if you don’t have maintenance staff on Saturday and Sunday – because those typically are the days that people take their trash out, on the weekends. And you don’t want to have fish that someone cooked the night before in a non-vented trash room for fourty-eight hours, because that’s going to create a real problem. And typically for the residents who live in close vicinity to the trash room – they’re the ones who complain first – so it doesn’t always work. So when we’re setting up programs, I think that’s the main thing we look at: how do we equal the playing field? 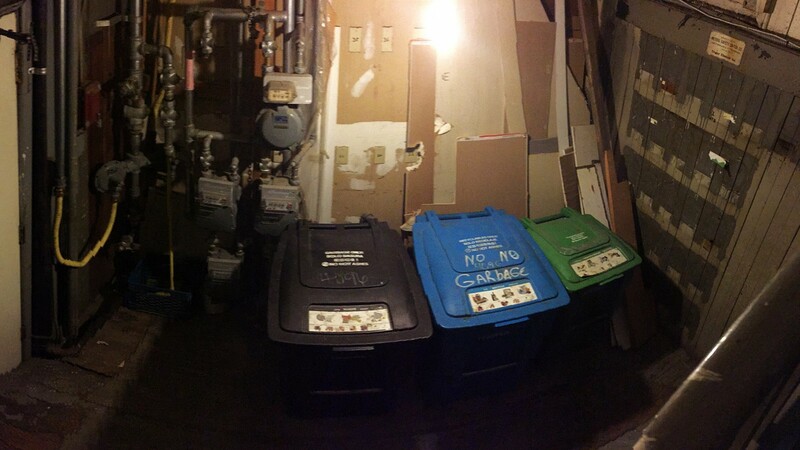 Most of the time, because of space constraints and we’re dealing with an older building stock, we’re talking about requesting the tenants to walk it down into basement areas to dispose of their recycling and composting, and then the trash chute is still there. TOS: Trash chutes. Here we come to one of the biggest challenges for programs in multistory buildings. I have here a 2011 report by the Recycling Council of British Colombia, that says that in Toronto city, high-rise buildings with garbage chutes had significantly lower levels of participation and higher levels of contamination than buildings without chutes. And this seems to confirm what I’ve been hearing from our guests. Chutes are convenient, and easy to use. So for a mandatory program like San Francisco, where there is pressure to increase participation – what can we do about waste chutes? ALEXA KEILTY: On every floor within a high rise building there’ll be a chute where people can just throw their trash, and it’s prioritising trash over all the other streams. So something to keep in mind is how can we stop prioritising trash, and how do we design and set up buildings from the get-go – and we have new ordinances requiring new construction to keep this in mind, but – when we’re talking about older buildings, how do we level the playing field? And we also encourage property managers to close their chutes and force the tenants to walk everything down into the basement area. They usually love that idea, because chutes typically can attract pests and all it takes is somebody to put one pizza box down there and then you have a jammed chute. So, they love to close chutes, but the problem is that the tenants board in San Francisco is very strong, and some tenants may consider this a reduction in services – and if they see it as a reduction in services, then they can apply to the rent board for a rent reduction. So because of that, property managers are very fearful, they don’t want to deal with lawsuits…it’s just a very tenuous situation for them. 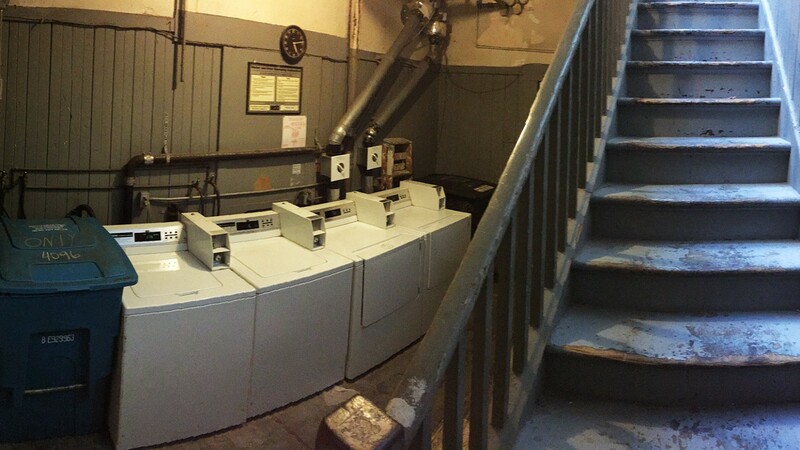 TOS: So that’s San Francisco’s waste chute strategy. But what about New York? JESSICA SCHREIBER: I’m Jessica Schreiber, I work at the Department of Sanitation and the Bureau of Recycling and Sustainability. I oversee all apartment programs, so any recycling programs that have to do with high rise buildings fall under my group. TOS: So New York’s organics recycling program is a voluntary program that has been up and running since 2013 and has been spreading through the City every since – with 148 high rise buildings involved in the program. JESSICA SCHREIBER: Chutes are definitely our biggest issue when working with buildings – particularly some of the newer buildings in the city that have a chute room on every floor and residents are very used to just bringing everything to the chute room and separating it there. By far what we think is the best option for organics is a single collection point, usually it’s in the basement. We want everything brought one spot. For residents who aren’t used to having to go to the basement for anything, bringing a separate food stream to the basement is daunting. So we have a lot of conversations about chutes with the building management. There are pros – if we were to make the chutes just for organics, and trash for the (hopefully) non-smelly items that can be separated on the side with the recyclables, that’s one option. There are not a lot of buildings in the city that have chosen to do that. Other cities, though, have reported that that option tends to create more of a smell and more of a maintenance issue, because this is loose food now going down the chute and getting stuck, and not always being bagged correctly. So we try to avoid chutes when we can and do a single collection area where possible. Usually that’s in the basement. 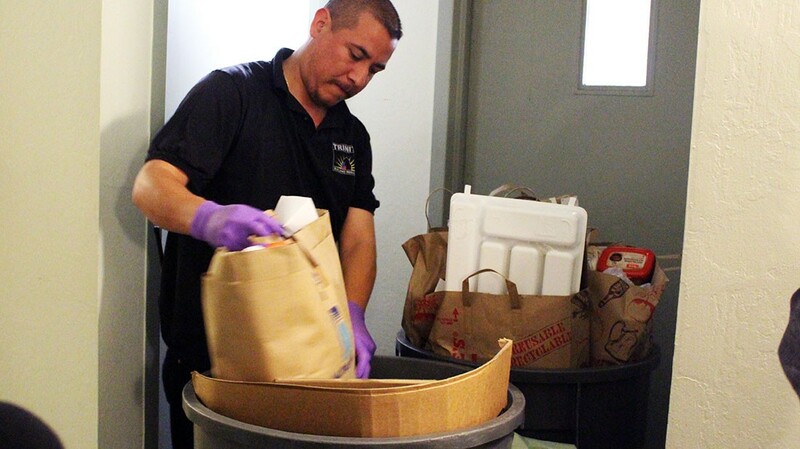 There are buildings where they’ve tasked the super with collecting food scraps from a bin on each floor in the chute room – so where they have that sort of building help, that’s also possible. TOS: So here we see more problems… It seems that avoiding chutes and focusing on a central collection point is a common strategy. And this brought me on to talk about one of the first participants of their program – the Morningside Heights Housing Corporation. Morningside Heights is an impressive residential cooperative apartment complex comprised of 6 high-rise buildings in the borough of Manhattan – close to Columbia University. The buildings are each 21 stories high, with a total of 980 apartments. How they decided to introduce organics collection here I think is worth bringing up. They decided on a simple approach at the beginning – using a centralised system not for each building – but for the complex itself. This had some unique benefits – not just in terms of reducing maintenance costs and equipment costs – which led to the program’s success in the building. JESSICA SCHREIBER: Morningside Heights started as a drop-off point for the whole complex. So they have multiple buildings, and instead of every building having its own collection spot in the basement, there was a drop-off point for the whole complex. The benefit of that is that it’s convenient for the building staff, it’s convenient for us to collect becayse we’re just taking it right from that point to the curb and it’s all centralised. The other benefit of that is that when it’s a drop-off point, it makes it very easy to educate tenants about how to participate. It’s a very clear message, and it’s also a point of education, so people walking buy who aren’t aware that this is an option will see it and become more engage. So I think it’s supportive of buildings who want to get their feet wet before they jump all the way in, and it’s also a good way to test it out. And you can see that when the bins are closed, they don’t smell because you’re getting service three times a week, so it doesn’t sit long enough to become a problem, and these solid plastic bins are not going to attract rodents. So it’s the best way to ease a building in and as residents become more used to bringing this stuff to this drop-off point, they’re going to actually want it to be in their basement because that’s even more convenient – like an added level of convenience to have it inside their own building, versus somewhere else in the complex. TOS: So centralised systems have a lot of benefits, especially if you can overcome the tricky chute issue. And just like the waste rooms, you’ll have to make sure the area is convenient, has adequate space, is well lit and clean. And remember – no matter what system you chose, you need to factor in convenient access for the hauler as well. Now, we’ve covered quite a bit of ground in terms of logistics. Keeping in mind space constraints, how waste will be collected in the building and by the hauler, costs – so weather you can afford maintenance staff or the extra bins, convenience for tenants, odours and pests, and the problems with chutes. In every aspect there’s a balance to be struck between convenience for the tenants, and practicality. And it can be tricky to do. What really struck me, and what my guests have all pointed out, is that no two buildings are alike. – Like snowflakes, or like people, they have their own characteristics, challenges and personalities. And the strategy you employ will have to be completely tailored to each building’s needs. TOS: In any given urban area, the age of the multistory buildings will factor into your organics recycling program. 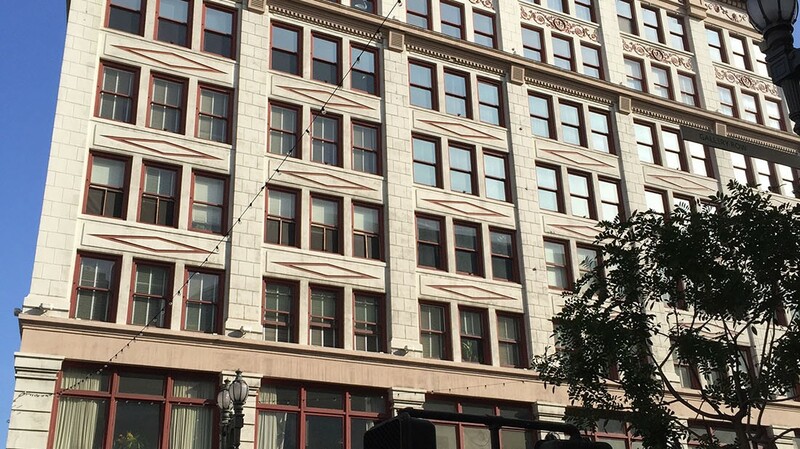 What are the issues with older buildings? Well mainly that most of them have single-chute systems with tiny waste rooms – or no waste rooms at all. Putting composting on a level playing field in this situation is very hard. Retrofitting is one solution – but an expensive one. San Francisco is encouraging people to close their chutes altogether – but there are some issues here too. So let’s look at the bigger steps we can take. The City of Milan in Italy, for example, where the majority of people live in apartment buildings, decided to close all chutes in the city in order to level the playing field. And it’s working – chutes are closed and all organics are collected in waste rooms or central locations. We’ll get deeper into this during our Milan case study in a later episode. Not all cities can take this approach. But they can make an impact in new buildings by requiring them to have adequate recycling facilities. Often, buildings are allowed to choose between a number of systems. For example – Alexa mentioned the new building code in San Francisco that says all new construction has to have recycling, composting and trash on an equal playing field. So new buildings, she told me, often have decent sized waste rooms on every floor, which as a fan of waste room systems I think is great. New chute systems are an option as well – either with multiple chutes for each stream, or just one for organics. We already heard from Jessica about the possible issues with these. Another interesting option that Alexa told me about are diverter systems for chutes – how do they hold up? ALEXA KEILTY: So they’re now putting in diverter systems. Basically, it’s one chute with a button that you push and then there’s a baffle at the bottom of the chute which pushes the recycling, composting or trash into the right bin. The problem with those is that they never seem to work properly, or the tenants in the building haven’t been trained properly to use it, so I haven’t actually found one that’s been working well unfortunately. TOS: “Okay so that’s a bit tricky then. I guess then the waste rooms are probably the best option at the moment”. ALEXA KEILTY: Yeah, I think so. I mean, the problem is just labour – you have to have labour seven days a week and not all buildings have that. TOS: Buildings are made up of people, and recycling systems are made up of people too. So successful organics recycling, then, is all about building relationships. With the tenants yes, but first of all with the building owner or manager. In a 2014 report by the Washington State Recycling Association called Sorting It Out – The state of Multifamily Recycling in Washington State, it asked recycling professionals about the top challenges they face in program implementation. And it’s quite telling that lack of support from building managers is number three on the list of challenges, just behind space and contamination. During our trip through California – we met with building managers…like Linda Corso…and saw just how valuable it is that they are fully on-board with the program and make it their own. But this isn’t always the case. There are factors that can influence their level of enthusiasm or commitment to the program. A building owner or manager may not know much about organics recycling – why it’s important, and whether it will cause odours and pests. This is where education and outreach is essential. JESSICA SCHREIBER: We do a lot of outreach, we go to a lot of building events and speak to a lot of management companies, and I always introduce organics and give a brief explination of how it works and why it’s important. When people hear that food waste is a third of our waste stream, that’s a pretty staggering statistic. So we always introduce it as part of the apartment program package. For buildings who express an interest, we will follow up enthusiastically – we’ll do a site visit and work with tenants to educate them along and bring them on board. We do definitely encounter buildings that say “no thank you” and are not interested. They basically say “not until I have to am I even going to consider this”. I think there’s still some stigma around it – smell and rodents and stuff. TOS: Now New York’s program is voluntary – which means they are dependent on building managers who are interested. Jessica told me that fortunately, they have their hands full with building owners who are – so they have no need to engage uninterested managers. But for a mandatory program – it’s a different story. LILY KELLY: I’m Lily Kelly. I’m senior Program Associate for Global Green USA’s coalition for resource recovery. We’re based in Santa Monica, California and we have offices around the country in New York, New Orleans, Washington DC, and here in beautiful San Francisco. TOS: We met with Lily Kelly of Global Green in her office during our trip last month. As part of Global Green’s goal to promote smart solutions for climate change, Lily has been exploring different solutions for organics recovery and working with cities [here you say ’systems’ instead of ‘cities, but it’s no big deal] on pilot projects in multistory residential buildings. LILY KELLY: When there’s an ordinance, or when there’s a law that requires composting, it really makes a difference and of course it does. It seems like a very obvious point to make, but just listening to the property managers changing their narrative about it from, “Oh, I don’t know if I want to compost, it seems gross and smelly” to, “How do we make this work? How do I make it not gross and smelly – by using bags or training my tenants better. How do I avoid any kind of fines for contamination – by teaching people how to do it and making signage really clear.” It really helps bring their minds to work on solving the problem, as opposed to just giving up on it and deciding it’s too hard. But then there are many other places where it’s still voluntary and that’s going to place a limit on it, if it’s more expensive. TOS: Even though the mandatory aspect can bring more people along – there will still be hesitant building managers. And one of the biggest barriers to their commitment is a worry over cost. This is an area you will need to address for mandatory programs, but even more so for voluntary programs. LILY KELLY: I think it is really important. In particular it shouldn’t be an extra cost for them to add a composting service. And there’s typically a transition period where they’re not going to reduce their trash service right away just because they’ve added a composting service. Down the line it may be possible, and ideally that what will happen is that there will be less trash volume so that service will go down and it’ll become less costly to the property manager. But as a safety precaution for preventing any overflow of trash, they should always try adding compost first, and then – as needed – reducing trash systems. So unless it’s mandated, getting that buy-in from them means there has to be at least a cost neutral option for them. ALEXA KEILTY: San Francisco has taken a very mild approach when it comes to enforcement. We have implemented some processing fees on buildings, so if we find over fifty percent compostables or recycling in the trash we can put a fifty percent processing charge on those accounts, and we have been doing that. That usually does get the attention of the property managers and they do eventually call and ask for assistance on how they can improve their setup and motivate their tenants. When we approach these property managers, we don’t start talking about the law and requirements right out of the gate because people don’t well respond to that, so what we try to say is that we’re offering this service, it can greatly help your building. It will also help maintain your building so it’s cleaner, if you get people thinking about how they sort their trash properly – they typically will manage it better so we talk about that. And if they’re still resistant and don’t want to work with us, then we start talking about the law. I’m afraid we will have to leave it here for this first episode of our special on organics recycling in multi-story buildings. I hope you enjoyed our journey so far, and the new format. We’ve covered some critical challenges and key factors that come into play today – and for episode two we continue in this vein to discuss tenant participation, bin lining strategies, dealing with demographics and more. If you have any questions or comments – you can contact us on organicstream.org website, or on twitter – our twitter handle is theorgstream.